Dogwood offers a variety fieldwork internships for occupational therapy students, dog trainers who want to learn more about animal assisted therapy and disability, and related healthcare and human service fields. We take community health, Level II Fieldwork, and research based project interns from local, national and international universities and dog training organizations. We do not accept short term (less than 12 weeks), level I fieldwork students, or job shadowing so we may preserve the privacy of our clients. Secondary to our unique placement opportunities, the openings for interns are competitive and we typically book out one to two years in advance. In some cases we take two interns at the same time. If you are already a professional or are not currently affiliated with an educational program, please see our POST PROFESSIONAL ROTATION page. Our schedule varies depending upon the time of year and activities, groups, or classes offered. The hours are long sometimes include weekend activities or workshops. The average work day is ten hours. While this rotation is a lot of fun, it is not all sunshine and puppies. As in any setting, interns are expected to participate in facility maintenance and equipment care that goes along with working with animals and caring for them. It is critical that interns understand that the animals we work with are alive, and that there are risks involved in animal assisted therapy. Dogwood also offers dog training, creating another level of complexity. We have 17 years experience in our field(s), and want interns to understand that when you work with live animals, there are chances of things not going as planned, and every year we learn from mistakes and continue to grow. While we work hard to maintain standards of Animal Assisted Intervention International, New Mexico Occupational Therapy Association, the American Occupational Therapy Association, International Association of Animal Behavior Consultants, and the National Board for Certification in Occupational Therapy, working with live animals brings with it an array of challenges that requires teamwork and communication to create solutions in real life situations. While we accept "driven" or "strong" interns, we do not consider Dogwood to be an entry level facility. It can be overwhelming for entry level interns because we see all ages and abilities, including students with no disabilities in our after school programs. We see individuals and groups in clinical and community settings. In order to work with the dogs, interns must also become familiar with our humane training methods and cues, animal observation and response to their needs, while juggling clients! It can be a lot to learn for anyone! Caseload and level of independence is unique to individual interns and our clients preference to work with them. Dress is casual professional. People may be cleaning a crate one minute and going into a professional meeting the next minute. Please be respectful and ensure that you can bend over, stoop, squat, perform YOGA/DOGA positions or demonstrate a somersault without showing cleavage or any torso skin- midriff or lower back. Tattoos and piercings are acceptable as long as they are not sexual, religious, political or perceived offensive by our clients or their families. The positions at Dogwood are limited and it can be very competitive. We are most interested in students and universities who can help us study and potentially strengthen the fields of animal assisted therapy and assistance dogs. Factors that impact the selection of candidates include the total number of applicants for any given time frame, experience in related areas, and the ability to fulfil criteria listed below. The more criteria that is met, the greater the chance for selection. Level II Fieldwork- it is preferred that Dogwood be the second or third Level II FW placement. Student and their university are willing to collaborate with Dogwood on a research project in the areas of Animal Assisted Therapy or Service Dogs as assistive technology/compensatory strategies. If appropriate, the above work would be submitted for publication (co-authored with Melissa Winkle, OTR/L, FAOTA). Student completes last Level II FW placement AND stay additional 4-9 months for doctorate focus work. **Completion of an additional project for Dogwood, Animal Assisted Intervention International, and other related organizations. Send a letter of interest detailing why you would like to come to Dogwood, what you would like to learn, and how you plan to apply that knowledge. Please include your experience with animals, people with disabilities, animal assisted therapy, assistance dogs, and any related experiences or projects. Include the potential dates for the rotation, all of your contact information, and your university or organization coordinators contact information. Please address each of the bullet points above, and ensure your university is agreeable. Transportation in Albuquerque and surrounding areas is not always available. If you will not be bringing a car, let us know. Next, set up an interview with Dogwood via SKYPE. The interview may include an OT, actual clients, other interns, volunteers or dog trainers. ** Dogwood publishes articles, intervention strategies, and offers workshops locally and internationally. Each intern is expected to contribute to a project for Dogwood and may have the opportunity to be published as a co-author or to co-present workshops. We hope to offer interns opportunities to develop professionally. Over two years ago I had the privilege of hearing Melissa Winkle speak about Animal-Assisted-Therapy (AAT) at the annual OT conference in Chicago. It has always been my dream to incorporate dogs into practice and I will never forget the passion she fueled within me that day. In that moment, I didn’t know I would have the opportunity to learn and work alongside her at Dogwood Therapy Services, let alone raise my own puppy to deliver AAT interventions. "I first met Melissa Winkle, OTR/L, when she was presenting an AOTA workshop about the therapeutic use of animals in 2004. I somehow convinced her to take me on as an intern as I was passionate about how to incorporate animals into OT practice. I had been interested in animal assisted therapy (AAT) throughout my education and it was the focus of my final research project. This was, however, the first time I learned actual clinical application, therapeutic use, measurable goals & documentation, animal welfare guidelines, and safety practices. I also learned everything I know about assistance dogs during my rotation. I discovered the different types of assistance dogs, training methodology, and how to evaluate a client for appropriateness of being placed with an assistance dog. The hardest thing about the experience was that it is a tremendous amount of material to learn in a matter of 3 months as AAT/assistance dogs is a specialized area in OT. For OT's completing Level II FW, I highly recommend this be your 2nd rotation. Secondly, prepare to be completely dedicated to this purpose during the time you are here and expect that you will wear a variety of hats. Flexibility is key! The most amazing thing about this experience was EVERYTHING! While the rotation was intense, I learned how to be an effective clinician, think "outside of the box", and have my heart warmed in ways I've never experienced before. "Working with dogs and helping people has always been a passion and a dream of mine. I came to Dogwood Therapy to work with Melissa Winkle because it was an amazing opportunity to combine both of my passions and learn from a professional who has perfected this type of service. I have been at Dogwood for one week and have already learned the difference between therapy dogs and assistance dogs and I have learned more about how they can be incorporated into Occupational Therapy, than I ever thought possible. In my previous research and experiences, I had a narrow view of what therapy dogs and assistance dogs could do for a person (with or without disabilities). However, I have learned that using a therapy dogs or assistance dog is more complex than I imagined. For me personally, the most difficult part about my rotation is being able to understand the dog’s behavior while understanding and observing the client’s behavior and measuring progress towards the client’s goals. 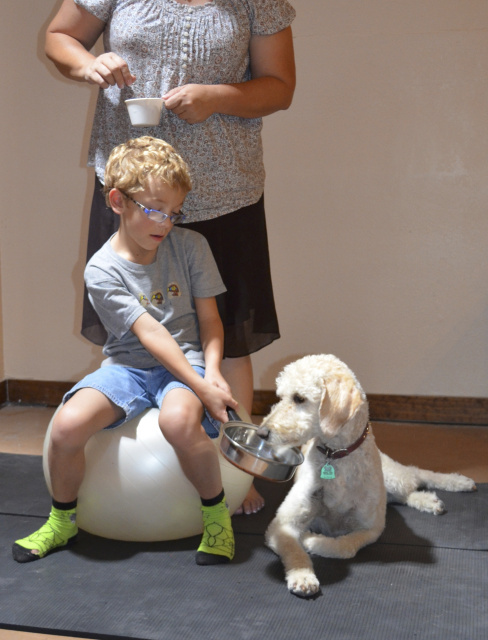 My recommendations for anyone who is thinking/is coming to work at Dogwood Therapy would be to have a basic understanding of dog behavior and training, the differences between therapy and assistance dogs.